A couple of weeks ago I mentioned that Mannatech, purveyors of useless sugar pills sold by multi-level marketing, had complained that I was misrepresenting their products by claiming that they served some purpose other than moving money from where it belonged to the pockets of scamsters. I pointed out that I would never make such a claim because it would not be true and thanked them for admitting that the products did nothing. In an outbreak of sanity and resistance to popular demand for people to be deceived, the BBC has closed down its complementary medicine web site. This is upsetting purveyors of quackery, of course, who believe in the untrammelled right to lie to people about "cures" using unproven (and often unprovable) potions and techniques. My view is that a day spent upsetting snake oil salesmen is not a wasted day, and I must congratulate the BBC for taking corrective action. You can go here to see the sad story as told by a site promoting fraud. Hey, Natural News, do you want some cheese with that whine? This is an example of the gloating taking place in the anti-vaccination cesspool about a recent court decision in the US. Have you heard about the recent court case where the US government admitted that children with mitochondrial disorders can get autism from vaccines, on the basis of scientific data? Of course, I don't expect you to recant anything... but it would be nice if you'd at least acknowledge it on your site. I will certainly acknowledge it. When it happens. I will recant. When given reason to do so. It is almost inevitable that anti-vaccination liars will try to spin anything to their advantage, but it takes real gall to claim that vaccines caused autism in a child who is not autistic. The same sort of gall it takes to declare that a government has admitted something when it has admitted nothing of the sort. A child with a possible genetic disorder suffered some health problems which coincided with receiving vaccinations. The court acted out of sympathy and ruled that some compensation could be appropriate, but made no ruling on any scientific claims about any connection between vaccines and autism. The court decision and the subsequent anti-vaccination liefest have been discussed in several places, but a reasonable coverage can be found at NeuroLogica Blog, Respectful Insolence and New Scientist. On March 2, 2000, Canadian curling champion Sandra Schmirler died of cancer. Her life was shortened significantly by a decision to reject medical treatment and to rely on snake oil and quackery. The person responsible for her early death was Mr William P O'Neill of an outfit called the Canadian Cancer Research Group. Mr O'Neill commemorated the anniversary of her death by posting the following message to Usenet. The content of the message and the fact that Mr O'Neill felt the need to post it anonymously should be sufficient evidence to demonstrate the quality of care and service that can be expected at Mr O'Neill's clinic. Thank you, Mr O'Neill. Your words say more about you than I ever could. More amusement from the archives. Science simplifies things. That's what Ockham's Razor is all about. Newton looked at the way the universe worked and summarised a lot of truth into three laws. Einstein looked at things Newton didn't see and came up with "E=mc2". Gene Ray goes the other way. He notices that the time is different in different places and expands out from there. What is this man talking about? God knows (but Gene knows better). Well, I'm convinced that something is going on at Denver. Actually, it's going on underneath. Those aren't runways you see, they're lids. I'm gradually getting the hang of living in two places, and every time I travel I seem to have to pack less stuff. One problem has been the intransigence of the technology, a matter of some embarrassment to a person who sells computer expertise for a living. I now think I have figured out how to keep two installations of Microsoft FrontPage in synchronisation on two computers so that I don't have to close my eyes and tap on wood with a rabbit's foot whenever I click the "Upload" button. (Yes, it was one of these events which caused the front page of this site to be erroneously updated with incomplete information during the week. Sorry about that.) Also, I have now discovered which piece of the hardware configuration at the country retreat was causing my keyboard and mouse to manifest free will. It looks as if I will be able to return to regular weekly updates of this site soon, but I won't promise anything until it happens. As a side note, it seems that the ChangeDetection people have changed their software (the messages are certainly different) and it now ignores the hidden commands telling it which parts of the page to monitor for changes. I have it set to only report changes to the list of pieces which change every week, but it now looks like it will tell everyone that the page has changed if I do nothing other than simply reload it to the server. Progress, they call this sort of thing. What I do know is that there will probably be no update next weekend because I will be at the great Australian Skeptics gabfest in the lovely inland town of Wagga Wagga. The gathering will bring together members of skeptics groups from all over the country so that we can do some socialising, put some faces to screen names, and work on ways to cooperate to spread the gospel of critical thinking. The date was chosen because of its astrological auspiciousness and we are are crossing our fingers and hoping for a good result. As a bona fide country town dweller I have to recognise that the drought is still with us so I will be abstaining from the group prayer session when they ask for fine weather over the weekend. I have two cars. On one recent day, both of them spent some time on the backs of trucks, one being brought in from the boondocks to have a new engine fitted and the other being taken to the repair shop to have some accident damage fixed. Being carless and having appointments a long way from home, I was sentenced to a six-hour trip by train and coach. Remembering the words of the philosopher Montague P'Ython, I was encouraged to always look on the bright side of life and saw this as an opportunity to do some uninterrupted podcast listening. I loaded up the iPod with several hours of interesting stuff and off I went on the great adventure. One thing I added to the playlist was the complete set of Quackcast podcasts as I felt that a second listen to them wouldn't do me any harm. They are produced by Dr Mark Crislip and you can find them all at www.quackcast.com. Dr Crislip shares my opinion about the worthlessness of the collection of rubbish generally known as Supplementary, Complementary and Alternative Medicine (or SCAM for short) and describes his approach as "evidence based ridicule". Of course the quacks can dismiss him easily as he is an infectious disease specialist and would therefore know nothing about diseases and infection. He simply doesn't have the mindset to understand how people can honestly imagine that homeopathy or iridology work, but then neither do I so it is no surprise that I agree with him. 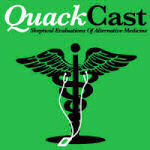 Quackcast is highly recommended, so go there and get downloading. I will be making another appearance as the Naked Skeptic in the May edition of the excellent Australasian Science magazine. It has been a little cold in Grenfell to go around naked and as a newcomer to the town I don't want the natives to jump to conclusions about me, so I actually wore clothes while writing the piece. I assume that the editor will forgive me on this occasion, but I promise to wear less each time I write a column until I have reached a suitable state of nakedness again. The article was a rehash of something I had done a couple of years back and while you are waiting for the magazine to hit the newsstands you can read an approximation here. I was riding along in my automobile, the missus beside me at the wheel, listening to some radio station which was playing a very strange and eclectic collection of songs. Three successive songs gave me reason to think. The first song was "Beautiful Boy" by John Lennon. The third was "Island in the Sun" by Harry Belafonte. I had not heard either song for a very long time. We pulled up at a set of traffic lights as Harry was doing his stuff and Her Majesty pointed out a poster advertising a singer who was about to appear at a local night spot. The song between those two was "Ebony and Ivory" by Paul McCartney and Stevie Wonder. (I had remarked on how even when you combine two of the greatest creative talents in the last 40 years of popular music you can still get drivel.) That song is about how people of different skin colours should be able to live together in one world. What was the name of the place where Sean Kingston was going to be singing? Oneworld. Sean Kingston and Harry Belafonte both have dark skin, and the poster was under a road sign pointing to Blacktown. You can read the full saga here. Unfortunately, the quacks couldn't be imprisoned for quackery, but a good result is a good result. If I had my druthers, they could empty out a few cells in prisons by releasing people in there for minor drug possession and non-payment of fines and use the space to lock up more charlatans and thieves who hide behind badges like "naturopath" and "homeopath" and "natural healer". In a truly just world they would all have to share their cells with very large men with lots of home-made tattoos and they could spend their time explaining to Bubba how they weren't worried about AIDS because it is a myth and, anyway, nobody ever gets sick from a virus. During the last week or so Osama bin Laden has been hiding in his cave and cowardly issuing videos containing idiotic threats about those cartoons published in 2006; the King of Saudi Arabia (where women can't drive but can be flogged for being raped and nobody can build a church) has called on the monotheistic religions to unite in a jihad against atheists; the Indonesian spawn of a noseless whore and general all-round porcine rectal structure Bakar Bashir (responsible for the murder of more than 200 people in Bali in October 2002) has called for violence against infidel tourists to Bali. To balance this out, Geert Wilders has made a film, Fitna, highlighting some verses from the Koran. The video was originally distributed online by LiveLeak, but they have received the usual death threats and have unfortunately decided to fold in the face of bullying. So far YouTube have not managed to remove the many copies loaded there (I don't know if they have even tried). Be warned, however, that you need a strong stomach. YouTube has an "adults only" warning on at least one copy and requires a statement of age before allowing people to see it.